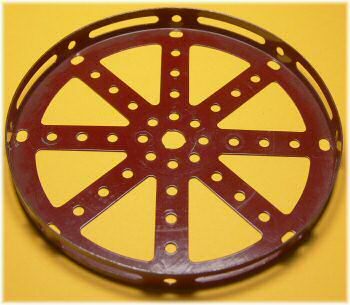 The hub disc is the first of the large circular parts, defining the larger Meccano outfits. It was launched quietly and appears in the December 1923 Meccano Manuals, as the "Large Wheel Hub". 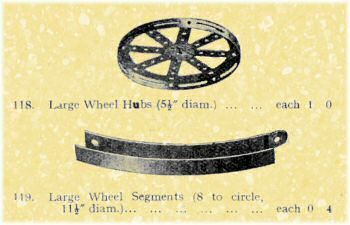 Alongside this part was the "Large Wheel Segment" part 119, and these two parts were intended to be used together to make a large diameter wheel particularly for stationary steam engines. Part 119 of course became the Channel Segment, and part 118 the Hub Disc, used on its own from 1935 onwards. The picture to the left is from the 1924 Magic Carpet catalogue, showing the original names of the parts. These names were also used in the November 1924 Meccano Magazine list of "New Meccano Parts". We are used to these being at least a year out of date when they appear. If you look carefully at this picture, you can see that there is a bush wheel attached to the hub disc. John Nuttall, our resident Meccano Magazine searcher, has found this reference in the July 1924 issue describing the name changes. He also has a Canadian parts list dated April 1924 showing the new names, which disagrees with the much later announcement of the 'new' parts in the Meccano Magazine. The first hub discs have a large keyhole-type central hole, rather like the later wheel flange (part 137). The picture to the right shows an example of one of these. This example clearly shows that the central hole is made after the initial stamping, as the Meccano stamping is cut through. There are enough examples of these parts to suggest they were a short-lived variation rather than a one-off. The photo in the parts listing above is taken from the example of a built-up wheel printed in the Meccano Magazine in November 1924, or something like it, and unfortunately means that we can't see the shape of the central hole in the earliest parts. Most nickel ones, however, have a plain central hole. During the early dark red period, the central hole gains three notches. The plain and three-notched central holes are shown right. This change is most likely related to the discussion about the changes to the bosses of sprocket and gear wheels detailed on page 95. 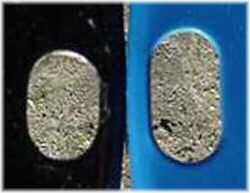 Nickel ones are also found with these notches, since the nickel-plated finish was still available to special order. The change to the three notches is referenced in this cutting from the Meccano Magazine, February 1931, which mentions the "new type" bosses. As usual with Meccano Magazine dating, we have to be very careful. Most dark red varieties have the three notches, dating the change to early in the dark red period, perhaps 1928. It's not immediately obvious, but the hub disc is made from the same stamping as the 6'' pulley (part 19c). 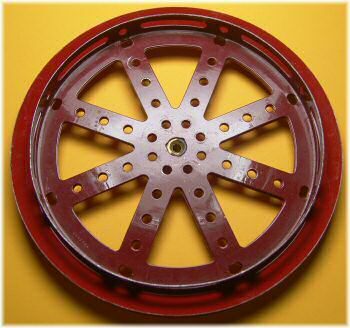 This picture to the right of a dark red hub disc over a medium red 6" pulley shows this quite clearly, and explains the presence of the three notches in the central hole of the hub disc. These three notches help to lock the boss of the 6'' pulley in place and prevent it slipping round. The changes to this part thus mirror the changes in the 6'' pulley part 19c, and allow us to make further deductions. The first of these is that we can see that the outer holes around the edge of the hub disc have to be stamped as a separate operation (since these holes don't exist on the stamping for the 6" pulley). This calls for the half-made hub disc to be re-punched, and could potentially lead to inaccuracies in the stamping. Sure enough, we find that most hub discs have some of the holes on the flange slightly out of line with the holes in the spokes, as you can see from the picture to the left. It's unlikely that this would affect any model builder, but it's one of those things that just might be useful to know. The only other variation in the design of the hub disc (apart from paint colours) is the change from the small elongated holes at the ends of the spokes to slightly larger ones. The two hole sizes are shown in the picture below. This change is also seen in the 6'' pulley part 19c and is thought to be at some point in the late 1960s. 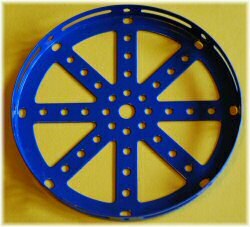 Do you have a black hub disc with large holes, or a blue Made In England one with small holes? Please take a photograph and send it to us! Although the pulley was blue from the beginning of the silver/yellow/black period (1964), the hub disc was black. Thus we might expect to see black hub discs with both the small and large elongated holes in the ends. Martin Hanson, our silver/yellow/black expert, has never seen a black hub disc with large end holes. The hub disc (and the 10-set) were very rare during the late '60s and putting a specific date on this type of part change is almost impossible. It's obviously right at the end of the silver/yellow/black period, though, unless we find more examples. You can see from the table below that the French blue hub discs (at least those supplied in the UK after the demise of Binns Road) don't have the three notches in the centre of the part, but they do have the elongated outer holes. Roelf also has a part-made hub disc found outside the Calais factory in 1987. It's obviously a mistake, as the flange has been formed before the side holes or triangular sections were stamped out. The interesting thing about this part is it shows that as late as 1987 the French factory were stamping out hub discs with the smaller holes on the outer edge. 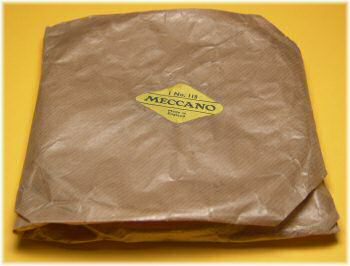 The example to the right shows a hub disc in the early post-war brown paper packaging. This will be after around 1950 when the part first became available. For those who are really interested, the brown paper used here is just under 15'' square, the hub disc placed flanges up in the middle, one corner is folded over first, then the two sides, and finally the opposite corner over the whole part. Are we going into too much detail yet? The two examples shown below are in yellow card boxes, type 19 (you can see the box code printed on the flap). The left-hand example is from at least 1954 after the introduction of product codes on the labels, and the right-hand one is from 1958-61 and in light red, as indicated by the light green label. From approximately 1962 the hub disc was supplied in the same packaging, but a paler yellow card. Do you have a boxed hub disc of a different type, particularly one in the thinner box 13? Do you have a medium red hub disc in a box without the product code on the label? These boxes are deep enough to hold the hub disc, but the similarly sized circular girder (part 143) is found not only in this box but in the much thinner box code 13, into which it doesn't quite fit. We haven't seen an example of the hub disc in a thinner box 13, but it is possible they might exist. All examples of the medium red hub discs found to date have the product code on the label, showing them to be 1954-on. Note: DMS/EMP refer to several nickel-plated varieties, some with a diameter of 5½'' and others of 5 3/8''. 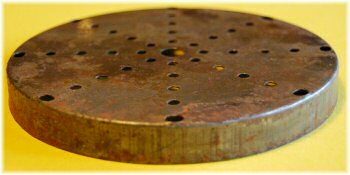 The hub disc was described as "Hub disc (5½'' diameter)" for several years after its introduction, but this seems to be a simplification of its actual size – all the examples found to date are 5 3/8'' diameter. ¹ We have not yet found a black hub disc with elongated end holes, nor a blue with small ones. The change is around 1970, but finding one or the other of these variations might pin it down. Total number of messages on this page: 8. This is page 1 of 2. I am almost certainly about to buy one more or less by accident. Can you tell me what to do with it ? That's what I was searching for on the internet. It's red, by the way. (If you want it, bid against me !). Your theory is borne out by the fact that the job lot in which the flanged ring came also contained quite a few bits and pieces in powder coated white. It seems that it would be a shame to respray it so it looks as though it will remain in white! Many thanks and a very Happy Christmas to you! Hi re White part 167b. It is almost certainly out of the Space Base 4850 set issued about 1997,it was a quite large and expensive set so I doubt there are large numbers of white 167bs remaining. Seems a shame to respray it if in good condition. I know we have not got to Part 167b yet, but I have just picked one up in white. It looks like it might have come from a space outfit. I am probably going to respray it blue or black. I won't however, if this is an ususual colour. I have a dark red 118 stamped Meccano with a noticeably deeper flange so must have been made from a larger blank. The diameter is the same as others , it has a round hole. It came with a dark red 143 and most of a 1927 set 6 (including lighter red 118 and 143). The dark red 143 is normal. 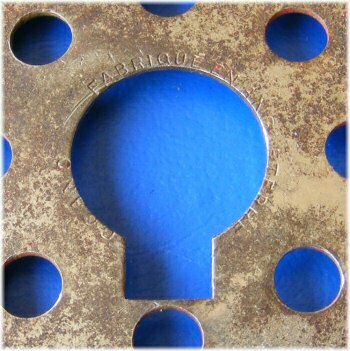 Staffan, French post-1980 blue Hub Discs may have small holes. 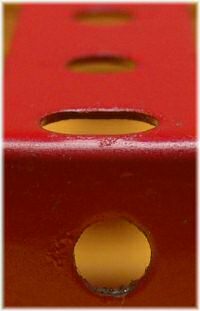 These are powder coated; stamps can be absent or very light, effectively being obscured by the powder coating.